WinMX is one of those sharing tools out there - just like the good old Napster. Unfortunally Napster is semi-dead now, so I decided to focus on a more usefull tool. Note: if you plan to download a lot, you might want to consider using LeechGuy instead. It's using a non-free ($10/month) service and does not have ALL the files you might be looking for, but it offers a faster way of downloading. First of all you must get the setup file from the WinMX website (the original website does not exist anymore - thanks JD for the tip! - try these: WinMX World or WinMX World Archive). If download is slow or not available, the please consider using a different location, or download version 3.31 of the last version 3.53 right here from WeetHet. The "Welcome"-window now appears, click the "Next" button to proceed installing. Next, the "License Agreement" appears, click "Yes" to continue. Now "Choose Destination Location", you may change the installation location if you like, click "Next". The new window asks you where to create a programgroup, click "Next". Setup is now finished, click "Finish" to complete the install. Now it's time to start WinMX for the first time. Click "START" - "Programs" - "WinMX" - "WinMX". First the "WinMX License Agreement" appears (again), click "ACCEPT AGREEMENT" to continue. The WinMX setup wizard will now guide you through the settings setup, click "Next" to start. Note: you might want to write down the username and password, you might need it in the future. First select the download folder by clicking the "Browse" button. MP3 Audio - Music, Soundtracks, etc. Zip archives - Archived files like programs, documents, etc. Check what you would like others to see and finish by clicking "Next". In this window you can "Add" or "Remove" folders you want to share - these folders are accessable by other users (read-only I hope). Select the folders and click "Next". Now select the speed of your connection and click "Next" to continue. Tip: ADSL (MXStream) users should select "128K ISDN" instead of "DSL" - MXStream is not THAT fast. Now we get close to the more difficult part, how are you connected ? If you're computer is directly connected to a modem or cable modem, then select the first option "There is a dial-up ...". If your computer is connected to a LAN network, corporate network, sharing the Internet connection, connected to a hub or switch, then select the second option "This computer is connected ...". Note: When in doubt select option 2 "This computer .... (LAN)". 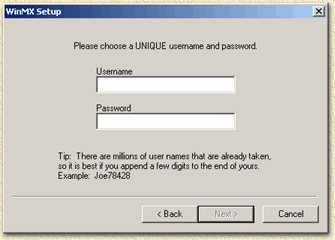 Here you can set if you are using a firewall (options 2, 3 and 4) like ZoneAlarm or Microsoft Internet Sharing, if you're not running either, you may check option 1 ("This computer is NOT ..."). Tip: If you're not sure or just want to be on the safe side, select option 4 "This computer is running ...". Make your selection and click "Next", now continue reading here (interface appearance). If you selected the option 2 ("This computer is connected to the internet through a local area network (LAN)") in the previous internet connection option, read on. If you are connected to the Internet using a proxy, then this is the place to enter the proxy settings. In this window you can set firewall settings as well. If you know what TCP/IP or UDP/IP ports are open, you can set them now. If in doubt check the first option "No, my incoming ...". Click "Next", continue reading. In the now appearing window we can change the interface appearance. Basically there are 2 color modes, white background (shown in the dialog window below) or black (below that dialog window). I prefer the white background, but some people prefer the black background. You can also set if you would like to work with a single or multiple windows. I suggest that you start by using the single window since multiple windows can become confusing. You have now completed the WinMX settings-wizard, click "Finish" to continue. A dialog window appears, stating that your serverlist is empty. Click "OK" (make sure you are connected to the Internet) to retrieve a serverlist. WinMX starts downloading a list of the available servers. Once WinMX completes the download the main window will be filled with a long list ... just don't pay any attention to it (yet). OK, so setup and settings are done now,... let's start looking for our favorite music, just to have an example how things work out here. In the first field you can enter the name of an artist, in the second filed the title. It is advisable to use parts of the name of an artist and or title, since not everyone uses the full names in filenames. In the first filed, you can select if you want to see all server, or any servertype based on connection type. The second field allows you to select a filetype. Audio Set the predefined Audio filetypes. Video Set the predefined Video filetypes. Pictures Set the predefined picture filetypes. Search Click this button to start the search. Clear Click this button to clear the fields. Search in New Window Opens a new window for the new search results. You might wnat the best quality MP3 so you compare bitrates ("bitrate" column), the higher the bitrate, the better the sound quality (use a minimum bitrate of 128 Kbps). So now we found some results, and we want the file. Downloading is pretty straight forward, double click the file you want to download. Your selection will now be copied to the "Transfer" window, which opens right after double clicking the selection. Here you see the download status... monitor the "Status" column to see if the download starts OK. If you get a time-out or any other error, you might want to consider removing the file from the download queue by right clicking the file and selecting "Clear". Other options can be found in the image to the left which explain themselfs pretty good. Note: while downloading, WinMX creates a file called "incomplete downloads.txt" in the download directory... DO NOT DELETE this file! Note: downloading can be pretty slow,... be patient ... To go back to the search window click "SEARCH" button and when you want to view the downloading files, click "TRANSFER" button .